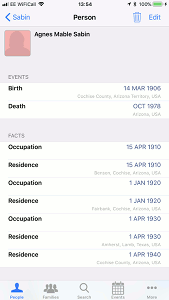 GedView is a viewer and recording tool for your genealogy database when you are out and about researching local records, or visiting locations such as graveyards looking for information. The latest version is compatible with iPhone/iPod/iPad devices running iOS 9 or above. You can either build your tree directly on your device, or can import a GEDCOM file from any genealogy application / service. GedView features a fast and efficient GEDCOM importer based around version 5.5.1, the defacto standard for GEDCOM files. You can still import earlier versions, and should not lose information (contact support if this happens). 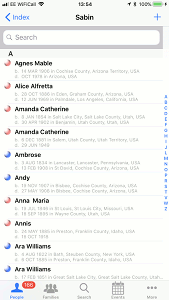 Many genealogy applications include their own extensions to GEDCOM to transfer information. GedView supports many of these, including things like shared events. As with earlier versions of GEDCOM, if you find an extension that is not supported feel free to lodge a request for a future update. Media files, e.g. photos, video etc. 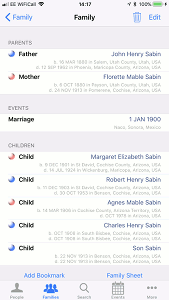 can also be imported along with your GEDCOM file. Add both the GEDCOM and your media files to a zip file and, so long as the application exporting the GEDCOM supports it, your media will appear in GedView. GedView can handle very large files and is capable of importing GEDCOM files that are hundreds of megabytes in size. The main test file contains over 165,000 people, and over 60,000 families, larger trees are supported, but performance will depend on your model of iPhone, iPad, or iPod. Files can be imported over cellular, wifi, email attachment, via iTunes files sharing, AirDrop, or via other apps such as Dropbox, iCloud Drive / Files etc. For more details see the User Guide. Your trees are stored, encrypted, on your devices, they are not sent to any website, mined for data, or passed on to anyone else, so you can be confident that any details of living people will not be exposed by viewing and editing your data in GedView. 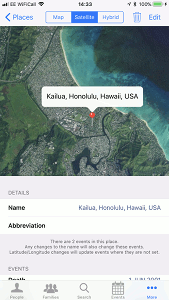 GedView provides a number of indexes to quickly access various items in your tree. These can be quickly "scrubbed" through with the quick access bar on the right, or, with the exception of the timeline searched for specific text. 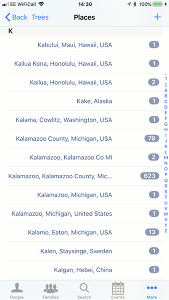 Indexes provide access to the main views for each type of item. The following top level views are available allowing you to view and edit information. If you make changes or add new information in GedView you may want to transfer the details to another person, or a different app / programs. With GedView your information isn't locked away. You can export from either your whole tree or a selected group of people. You can also choose to only export changes since a specific date/time, or whether to include living individuals. Exported files are GEDCOM 5.5.1, with extensions where applicable, e.g. 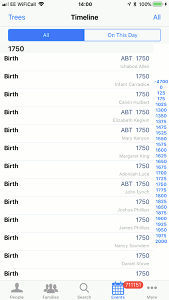 places are not part of standard GEDCOM. Media items, e.g. pictures, video, documents etc. can also be exported. In this instance a zip file will be created rather than just a GEDCOM file. Exported files can be transfered in the same methods available for importing files.